Modern though they may seem, the dishes are firmly rooted in their traditional essence; for example, ikan chuan chuan—a rustic dish of a whole fish, fried and served in a light ginger and tau cheo (fermented soybean paste) sauce. At Candlenut, Malcolm uses meaty fillets of threadfin, which he swathes in a smooth, rich sauce made with ginger paste and tau cheo. The resulting rendition is refined and elegant, yet unmistakably ikan chuan chuan. Using good ingredients and going back to the basics also help with innovating his dishes. For cincalok pork, his team makes cincalok (fermented baby shrimps) from scratch, an ingredient home cooks typically buy bottled. Being in control of the fermentation process means they can control the resulting, often pungent flavour that is so integral to the dish. “Cincalok pork is usually made with pork belly, but we wanted to lighten it, so we made tau kwa (firm tofu) the main protein and add sliced Iberico pork secreto, which we stir-fry then braise quickly in the gravy before serving,” he said. Like most other Peranakan restaurants, Candlenut gets plenty of flak from fussy Peranakans who are fiercely protective of their culinary traditions. Some would rather see beloved dishes like babi pongteh made the way it has been for generations; others are adamant that no one makes chap chye/buah keluak/insert-beloved-traditional-dish-here better than their matriarch or patriarch. Earning a Michelin star for his efforts certainly help prove the point. But for the 33-year-old baba, this is just the beginning. 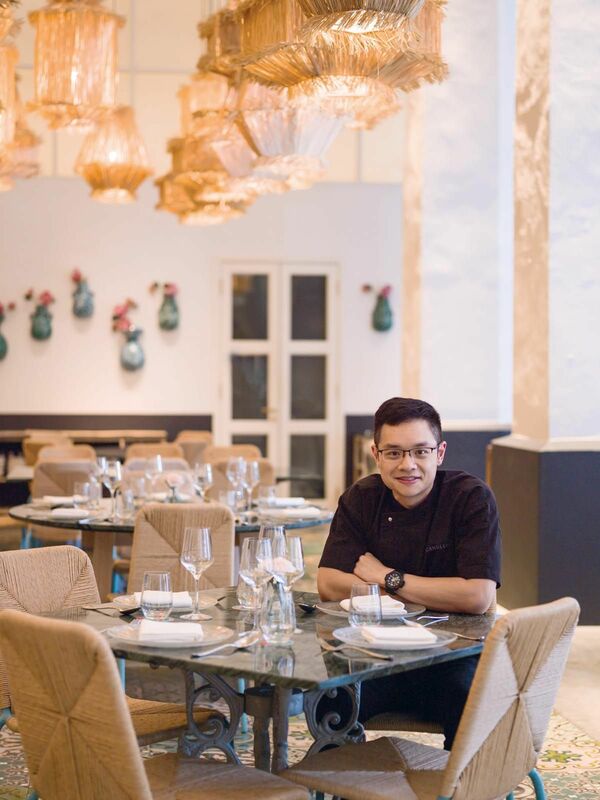 His plan for the next decade is to travel and learn about the roots of Peranakan cooking, bolstering his already firm foundation with an eye on bettering his ideal of the cuisine. Each component of the dish is treated with care. “To keep the textures, we braise the pig skin, pork belly and intestines first. Then we use the same liquid to braise the chicken wings,” he explains. He stews the ingredients separately, so the chicken doesn’t break down before the innards are tender. He then reduces the gravy before serving. “It takes time and effort, but it’s very refined,” he affirms. “Loh kai yik was on the a la carte menu at the previous restaurant but no one ordered it. Now we put in on the tasting menu, so people are forced to eat it (laughs).